Warning. Dr Larry Hurtado and others embracing a similar perspective disagree strongly with the views of the scholar to be discussed in this post. I will address some of Hurtado’s criticisms of Dr Daniel Boyarin at a later date. But now you know that what I am covering here is not a consensus view. But it offers ideas that deserve exploring and thinking through, whatever position arrive at in the end. I am sure I am not alone in having wondered at some time how it can be that Roman authorities, as we are told, could not easily tell Christians apart from Jews in the early days. One group was dominated by those who worshiped Jesus and did not keep the Jewish customs and the other by those who cursed Jesus and did keep the Jewish customs. So when in Acts we read of authorities being prepared to dismiss complaints of either party because they thought the issue was merely over legalistic quibbles, something does not sound quite right — or “coherent”, as a scholar interested in criteria of authenticity might say. Something’s missing from this equation. Recently I finished reading Tom Holland’s In the Shadow of the Sword. He makes the point Christianity and Judaism as we understand them did not really come into their own, that is, separate as truly distinct religions until the fourth century. (He cites scholarly works, of course.) What led to that clear demarcation between the two as opposing religions was the work of the heresiologists on both sides. There arose a situation where it became necessary for Christians who had achieved some political power and status to draw clear boundaries to define who was ‘in’ and who was ‘out’. Jewish authorities were correspondingly obliged to do the same. 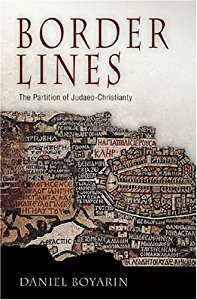 I am in the early stages of reading Daniel Boyarin’s Border Lines: The Partition of Judaeo-Christianity. Fate must have led me to this book just after reading Tom Holland’s because Boyarin expresses the very same view of the late definitive separation between the two religions. (I don’t really believe in Fate, by the way.) As would be expected given the different themes of the two books, Boyarin goes into more detail than Holland to make his case. He addresses the long-established conservative view that the final break between the two happened after the first Jewish War, or certainly no later than the second in the 130s. The real meaning of the Pella legend? One of his interesting points is made in relation to the legend of the early Church fleeing to Pella. That has often been interpreted as the final breach between Christianity and Judaism. 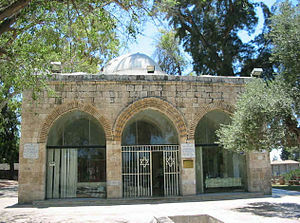 The Jerusalem Church fled the city to escape the imminent conquest of the city by the Romans. Eusebius even links this with a heavenly voice heard in the Temple saying “Let us remove hence!” (Quaint translation of “Armaggedon outta here”.) Later Ebion was believed to have arisen from among these Christians and founded the “Ebionites” — Jewish Christians who had truly separated themselves from Judaism. Boyarin puts a fly in the ointment of the legend that this event might be interpreted as the final rift between Judaism and Christianity. Boyarin at this point reminds readers of the later tradition that Jewish-Christians (Ebionites) emerged from Pella — it’s only a late tradition, but it is consistent with such a flight not being seen originally as a break from Judaism. That’s just by way of background matter. What eventually came to be the core differences that clearly distinguished Judaism from Christianity were, in the early years, common to both groups, those who followed Jesus and those who did not. Boyarin then examines the place of the Logos in early Jewish religious thought, and how we see Christians borrowing this concept and treating it in a very Jewish midrashic way in the opening verses of the Gospel of John. That, along with other details, is for a future post. There is, of course, more to the answer of the question in this post’s title, but let’s approach this one step at a time. Posted on 2013-04-17 23:15:11 GMT+0000 by Neil Godfrey. This entry was posted in Biblical Studies, Book Reviews & Notes and tagged Boyarin: Border Lines, Christianity, Daniel Boyarin, Judaism, Pella, Yavneh. Bookmark the permalink. I find Boyarin in this book to be doing something very common to scholars who work in post-modernish ways like he does here: a lot of theory and what amounts to hypothesis, and not a lot of evidence. He can go on for pages speculating on the significance of constellations of concepts, and all seemingly based on one or two scattered references. It’s quite wearying. Whether Boyarin’s account is true or contains much, some, or none, of the truth I don’t know. But I do know that anyone who claims that there is anything particularly ‘post-modern’ about the book under discussion cannot possibly have read it. Moreover anyone who claims the work is based on ‘one or two scattered references’ cannot even have been troubled to look at the index or the endnotes before launching into unjust invective. As for my comment about his hypothesising on the basis of inadequate evidence, I was maybe harsh. The first sentence of the first passage would have been intelligible to a careful reader in the early 19th century; the actual ‘suggestions’ that Boyarin is there putting into a capsule for purposes of introduction, would have been perfectly intelligible in the 18th. The second sentence is intended to trigger associations with the psychoanalytic tradition, which began circa 1900 — so perhaps the work is ‘psycho-analytic-ish’? The word ‘moment’ brings in a new association: it is employed as a transliteration of the “Moment” of early 19th c. German philosophy. Perhaps you are right that this special use of “Moment” is disreputable jargon; if so, Marx and Engels prophetically anticipated your acute critique of this slack-minded ‘post-modern-ish-ism’ 150-odd years ago in a familiar witty sentence from the open chapter of ‘The German Ideology’ (“Übrigens sind diese drei Seiten der sozialen Tätigkeit nicht als drei verschiedene Stufen zu fassen, sondern eben nur als drei Seiten, oder um für die Deutschen klar zu schreiben, drei »Momente« …”). This suggests that the work is basically Idealist or rather ‘Idealist-ish’, and that Boyarin belongs to the community of Idealist-ish scholar. It also suggests thoughts kind of ‘communism-ish-ist’ — or, not to put too fine a point on it: Stalinist (für die Ostdeutschen klar zu schreiben). The second passage from p. 74 uses the word ‘knowledge/power’, which is indisputably specifically Foucauldian; I am gathering that this strikes you as decisive since you took the pains to leaf further into the book to root it out for us; but the idea that any use of Foucauldian argot makes a work ‘post-modern-ish’ would have to forget that Mr. Foucault was quite dead when e.g. ‘La Condition post-moderne’ was, e.g., translated into English and was perfectly indifferent, and not long for this world, when it appeared in French. In ‘Border Lines’ and elsewhere ideas which, though changing, can well be fit into the same little capsule you quote in the first sentence, are explicitly developed in an overtly biological analogy — sc. with the reciprocal differentiation of species arising from the same near ancestor. I recommend to you, then, as a lover of truth and evidence, that you convict ‘Border Lines’ and ‘The Jewish Gospels’ of a vulgar neo-Darwinism. –Indeed, since (as we have seen) you are yourself working in some kind of Stalinist-ish framework, I recommend following your fellow members of the Stalinist-ish community of scholars and throwing in something about Boyarin’s palpably ‘merely mechanical’ materialism. But this is to say too little. A lover of truth and ‘evidence’ like yourself can hardly fail to notice that Boyarin’s object in those very passages is specifically cultural; surely, you must affirm, anyone who knows how to read a book will find in these rancid biologistic analogies a new-model ‘Social Darwinism’ with a familiarly genocidal tendency. In your final phantasia, then, I recommend that you get to the bottom of things, and decide the real question: Which is the fundamental source and inspiration of Boyarin’s work: Mein Kampf? or the Protokolle der Weisen von Zion? It must be the latter. Somehow I sensed something sort of anti-semite-ish about your scholarship, EmmaZunz. Keep up the good work; truth and evidence are just not getting the respect they deserve these days; someone has to hold the line. Let us put a stop to these post-modernist-ish fripperies and concentrate on the all-pervasive Doctors Plot Boyarin is evidently advancing. Do connect the dots for us EmmaZunz! One especially ungrammatical bit there that should read “It also suggests that your own thoughts are kind of ‘communism-ish-ist…” There are others but I seem not to be able to edit. That was funny, thank you! While post-70 “orthodox” Judaism did not see the “flight” of ben Zakkai as traitorous, the zealots certainly viewed people like him (such as Josephus) this way, as do the Dead Sea Scrolls, which specifically refer to people like this as traitors, even traitors to the New Covenant, if I recall correctly.